Marama Davidson: “I will not be silenced” about the blockade of Gaza. Women's Boat to Gaza > Blog > News > Solidarity > Marama Davidson: “I will not be silenced” about the blockade of Gaza. 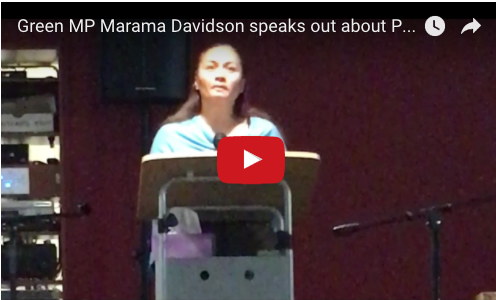 Listen and watch this powerful address by Marama Davidson (‘I will not be silenced‘). The New Zealand Aotearoa Green Party MP Marama Davidson speaks about her life-changing experience on the Women’s Boat to Gaza, and her goal of enduring peace for both Israel and Palestine, which can only come with an end to the blockade of Gaza. She spoke at at the Auckland Public Library, Aotearoa New Zealand on November 5, 2016, for a Parihaka Day event, which commemorates the history of peaceful indigenous resistance in the face of colonial aggression against the Māori people (to learn more about the history of Parihaka see http://parihaka.maori.nz/).